ThemeIsle WordPress themes are well coded professional premium themes. They have a good collection of professional themes for nearly every kind of website. All ThemeIsle themes come with guaranteed updates and support from their dedicated members only area. Get 20% off when you use ThemeIsle coupon. WPBeginner’s exclusive ThemeIsle Coupon code helps you get 10% off their professional WordPress themes. All you have to do is follow the instructions below to properly redeem the ThemeIsle coupon code, so you can get the maximum discount on ThemeIsle. First you need to visit the ThemeIsle website. Then click the “Join the Club” banner at the top of the page. Your membership will give you access to all ThemeIsle WordPress themes. On the next page, click “Join Now” under the plan you want to purchase. In the popup window that appears, click the small blue “Coupon?” link at the top. Now you’ll see the 20% off discount applied to your total. That’s all. 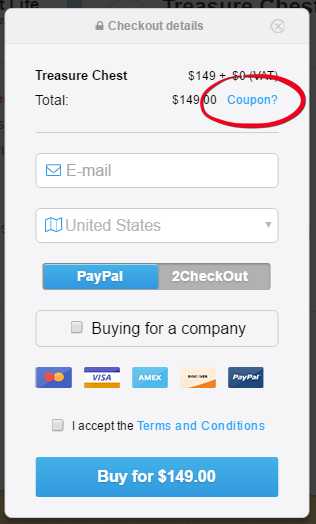 Go ahead and enter your email to complete your purchase via PayPal or 2CheckOut. We hope you found our ThemeIsle coupon code to be helpful. At WPBeginner, we work hard to negotiate exclusive discounts for our users.